In Digital Music Recording Studio this semester, students have been learning the basics of recording music and performing, producing, and mixing in a studio environment. The STEAM-oriented class focuses on producing recordings that are balanced and easily edited. 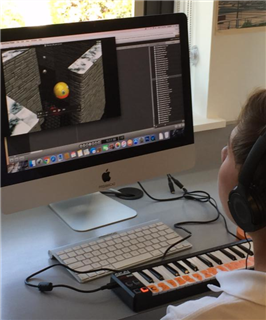 Recently, students have been using GarageBound and Soundstation to create an original, one-minute melody that dramatically underscores the action of a PacMan- inspired video game.